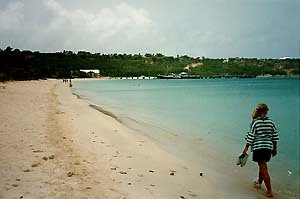 Anguilla is arguable one of the few bourgeois societies of the Caribbean. Most Anguillans own a house and a small plot of land and remain a friendly as well as an entrepreneurial nation. Anguilla is probably the best kept secret in the Caribbean. There are no fewer than 33 glorious white sand beaches with some of the most luxurious resorts and hotels. 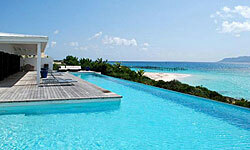 If it is a quiet beach time you are seeking Anguilla is the place for you. The Island is discovered by many visitors and celebrities as a haven of tranquillity. However you can enjoy the best of both worlds as a 20 minute ferry ride connects you with cosmopolitan St. Martin with its designer boutiques and French creole nouvelle cuisine. 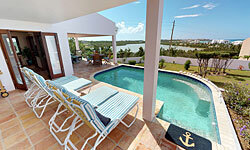 While in Anguilla we will soothe you and slow you down to our peaceful way of life. Enjoy some of the most beautiful beaches in the world, Shoal Bay, Meads Bay, Rendezvous Bay, etc., etc. or enjoy some of our 'adventure' beaches. Long Bay is an 'adventure beach' because it has the reputation for wonderful shells and is reached by "turning at the house with the green fence" then following the barely visible tracks through a goat pasture, you have to give way to the chicken and her ten chicks just a couple of days old. Another adventure beach is Little Bay, the only problem is getting there. You have to hire a boat and reach it by sea, or instead you can climb down a rope and fishing net ladder which someone has tied to the cliff top. It is 100 meters of beach surrounded by high cliffs on three sides and it has lots of natural wild life. The beaches are uncrowded and the only footsteps you are likely to see are yours. The year round tropical climate makes this the ultimate vacation destination. 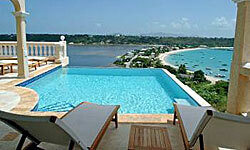 Anguilla has a good selection of excellent restaurants and small bars with music and beach side dancing. Most dining out is casual and there is not a restaurant that demands a jacket and tie, although you may wear one if you wish. Go to Island Harbour and spend a day at gorgeous Scilly Cay. Spend a day at West Shoal Bay Beach and enjoy a barbecue fish lunch at Uncle Ernie's. Go to Sandy Ground and take a trip to Sandy Island, you can enjoy the Sandy Ground Beach Bars which have live music. Don't miss Johnno's, Wednesday evenings. Spend a day at each of the following exclusive beach resorts; Pineapple Beach Club, Cap Jaluca, Malliouhana, Casa Blanca, Coccoloba (you can play tennis here). Water sports and scuba diving trips can be arranged. Have a enjoyable day shopping at St.Martin. It is quite easy to take a day trip to St.Barts and Saba by sea or air. Enjoy local food at Old House Restaurant and Brother's Cafeteria. 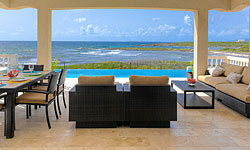 For evening entertainment see Anguilla Life Magazine and enjoy the local Caribbean music.